R. B. Skeie et al. A key question in climate science is how the global mean surface temperature responds to changes in greenhouse gases. This dependency is quantified by the climate sensitivity, which is determined by the complex feedbacks in the climate system. In this study observations of past climate change are used to estimate this sensitivity. Our estimate is consistent with values for the equilibrium climate sensitivity estimated by complex climate models but sensitive to the use of uncertain input data. Release of methane, one of the major greenhouse gases, from melting hydrates has been proposed as a mechanism that accelerated global warming in the past. We focus on Arctic Ocean warming as a robust case study for accelerated melting of hydrates, assessing the impact of Arctic methane release on global air temperatures during the next century. Contrary to popular belief, it is shown that methane emissions from melting hydrates from the Arctic seafloor is not a major driver of global warming. Atmospheric nitrate contributes notably to total aerosol mass in the present day and is likely to be more important over the next century, with a projected decline in SO2 and NOx emissions and increase in NH3 emissions. This paper investigates atmospheric nitrate using multiple global models and measurements. The study is part of the AeroCom phase III activity. The study is the first attempt to look at global atmospheric nitrate simulation at physical and chemical process levels. The role of aerosols in the changing polar climate is not well understood and the aerosols are poorly constrained in the models. In this study we have compared output from 16 different aerosol models with available observations at both poles. We show that the model median is representative of the observations, but the model spread is large. The Arctic direct aerosol radiative effect over the industrial area is positive during spring due to black carbon and negative during summer due to sulfate. Over the past decades, the geographical distribution of emissions of substances that alter the atmospheric energy balance has changed due to economic growth and pollution regulations. Here, we show the resulting changes to aerosol and ozone abundances and their radiative forcing using recently updated emission data for the period 1990–2015, as simulated by seven global atmospheric composition models. The global mean radiative forcing is more strongly positive than reported in IPCC AR5. This paper evaluates the ability of six global models and one regional model in reproducing short-lived pollutants (defined here as ozone and its precursors, aerosols and black carbon) concentrations over Asia using satellite, ground-based and airborne observations. Key findings are that models homogeneously reproduce the trace gas observations although nitrous oxides are underestimated, whereas the aerosol distributions are heterogeneously reproduced, implicating important uncertainties. The vertical distribution of atmospheric aerosol is an important factor in its effects on climate. In this study we use a sophisticated model of the many interacting processes affecting aerosol in the atmosphere to show that the vertical distribution is typically dominated by only a few of these processes. 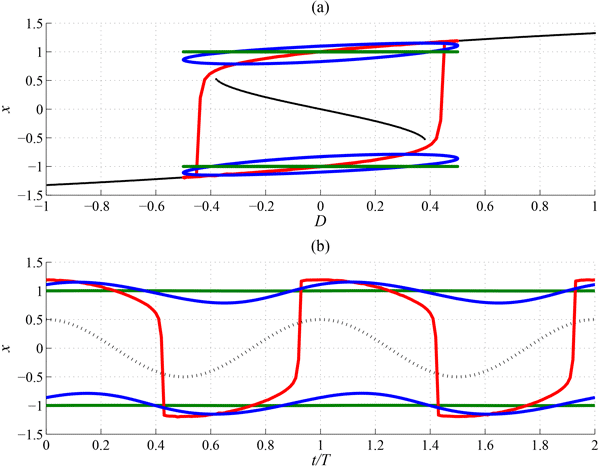 Constraining these physical processes may help to reduce the large differences between models. However, the important processes are not always the same for different types of aerosol. Different greenhouse gases (e.g. CO2) and aerosols (e.g. black carbon) impact the Earth’s water cycle differently. Here we investigate how various gases and particles impact atmospheric water vapour and its lifetime, i.e., the average number of days that water vapour stays in the atmosphere after evaporation and before precipitation. We find that this lifetime could increase by around 25 % near the end of this century, from a present-day value of 8 days, if we follow a business-as-usual pathway. This study highlights the role of oxidants in modeling of the preindustrial-to-present-day aerosol indirect effects. We argue that the aerosol precursor gases should be exposed to oxidants of its era to get a more correct representation of secondary aerosol formation. Our global model simulations show that the total aerosol indirect effect changes from −1.32 to −1.07 W m−2 when the precursor gases in the preindustrial simulation are exposed to preindustrial instead of present-day oxidants. The climate impacts for emissions of different pollutants can be made comparable with weighting factors. This article estimates these weights based on temperature change for short-lived pollutants, such as methane and black carbon. Emissions from different seasons and regions are compared, for instance Europe and East Asia. The responses are calculated for four regions, where we see that the responses can be much higher in the Arctic than globally in some cases. This study uses global climate models to quantify how strongly man-made emissions of selected pollutants modify the energy budget of the Earth. The pollutants studied interact directly and indirectly with sunlight and terrestrial radiation and remain a relatively short time in the atmosphere, leading to regional and seasonal variations in their impacts. This new data set is useful to compare the potential climate impacts of different pollutants in support of policies to reduce climate change. Air pollution can reach distant regions through intercontinental transport. Here we first present results from the Hemispheric Transport of Air Pollution Phase 2 exercise, where many models performed the same set of coordinated emission-reduction experiments. 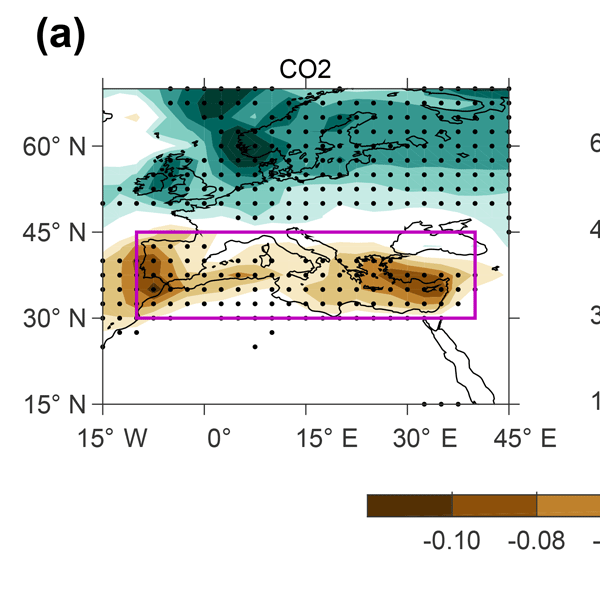 We find that mitigations have considerable extra-regional effects, and show that this is particularly true for black carbon emissions, as long-range transport elevates aerosols to higher levels where their radiative influence is stronger. A high-resolution, coupled atmosphere--climatic mass balance (CMB) model is applied to Svalbard for the period 2003 to 2013. The mean CMB during this period is negative but displays large spatial and temporal variations. Comparison with observations on different scales shows a good overall model performance except for one particular glacier, where wind strongly affects the spatial patterns of CMB. The model also shows considerable sensitivity to model resolution, especially on local scales. Methane is a key greenhouse gas. Observations at surface sites show a more than 10 % increase over the period 1984–2012. Using an atmospheric model we calculate a growth in the atmospheric chemical methane loss the last decades. Without this, the rise in atmospheric methane would have been even higher. The model reproduces trends and short-term variations in observation data. However, some discrepancies in model performance question the accuracy in estimates of emission increases in Asia. Radiative forcing (RF) of black carbon (BC) in the atmosphere is estimated using radiative transfer codes of various complexities. Here we show that the two-stream radiative transfer codes used most in climate models give overly strong forward scattering, leading to enhanced absorption at the surface and overly weak absorption by BC. Such calculations are found to underestimate RF in all sky conditions by 10% for global mean, relative to the more sophisticated multi-stream model. Far from black carbon (BC) emission sources, present climate models are unable to reproduce flight measurements. By comparing recent models with data, we find that the atmospheric lifetime of BC may be overestimated in models. By adjusting modeled BC concentrations to measurements in remote regions - over oceans and at high altitudes - we arrive at a reduced estimate for BC radiative forcing over the industrial era. Reducing CO2 from shipping – do non-CO2 effects matter? 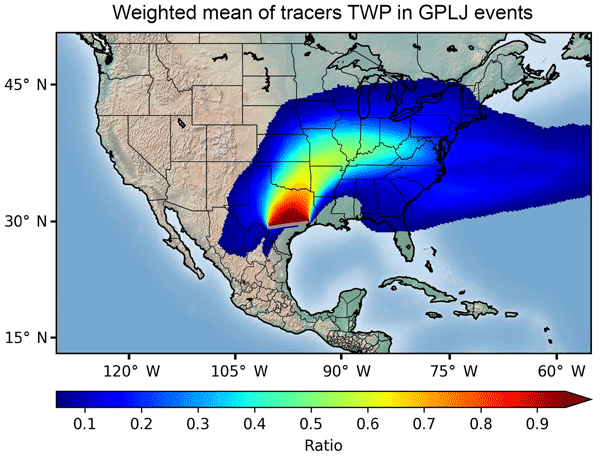 We analyse moisture transport triggered by the Great Plains low-level jet (GPLLJ), a maximum in wind speed fields located within the first kilometre of the US Great Plain's troposphere, through the innovative Eulerian Weather Research and Forecasting Model tracer tool. Much moisture associated with this low-level jet has been found in northern regions located in a vast extension of the continent, highlighting the key role played by the GPLLJ in North America's advective transport of moisture. Turbulent fluxes represent an efficient way to transport heat and moisture from the surface into the atmosphere. Due to their inherently highly complex nature, they are commonly described by semiempirical relationships. What we show here is that these fluxes can also be predicted by viewing them as the outcome of a heat engine that operates between the warm surface and the cooler atmosphere and that works at its limit. The present study aims at explaining how intermittency (i.e., the alternation of dry and rainy periods) affects the rate at which precipitation extremes increase with temperature. Using high-resolution rainfall data from 99 stations in the United States, we show that at scales beyond a few hours, intermittency causes rainfall extremes to deviate substantially from Clausius–Clapeyron. A new model is proposed to better represent and predict these changes across scales. Cultural processes are underrepresented in Earth system models, although they decisively shape humanity’s planetary imprint. We set forth ideas on how Earth system analysis can be enriched by formalising aspects of religion (understood broadly as a collective belief in things held sacred). We sketch possible modelling avenues (extensions of existing Earth system models and new co-evolutionary models) and suggest research primers to explicate and quantify mental aspects of the Anthropocene. The bias correction of surface downwelling longwave and shortwave radiation using parametric quantile mapping methods is shown to be more effective (i) at the daily than at the monthly timescale, (ii) if the spatial resolution gap between the reference data and the data to be corrected is bridged in a more suitable manner than by bilinear interpolation, and (iii) if physical upper limits are taken into account during the adjustment of either radiation component. Sowing and harvest dates are a significant source of uncertainty within crop models. South Asia is one region with a large uncertainty. We aim to provide more accurate sowing and harvest dates than currently available and that are relevant for climate impact assessments. This method reproduces the present day sowing and harvest dates for most parts of India and when applied to two future periods provides a useful way of modelling potential growing season adaptations to changes in future climate. The dynamics of our climate involves multiple timescales, and while a lot of work has been devoted to quantifying variations in time-averaged variables or variations in their seasonal cycles, variations in daily variability that occur over several decades still remain poorly understood. 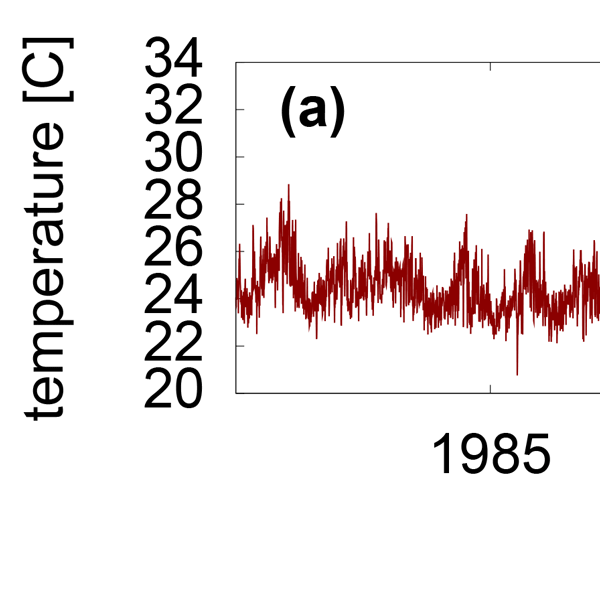 Here we analyse daily surface air temperature and demonstrate that inter-decadal changes can be precisely identified and quantified with the Hilbert analysis tool. The Systematic Correlation Matrix Evaluation (SCoMaE) method applies statistical information to systematically select, transparent, nonredundant indicators for a comprehensive assessment of the Earth system state. We show that due to changing climate forcing, such as anthropogenic climate change, the ad hoc assessment indicators might need to be reevaluated. Within an iterative process, this method would allow us to select scientifically consistent and societally relevant assessment indicators. We define three new climate indices based on monthly mean temperature and total precipitation values that describe the main features of the climate in the Baltic states. Higher values in each index correspond to (1) less distinct seasonality and (2) warmer and (3) wetter climate. It was calculated that in the future all three indices will increase. Such indices summarize and illustrate the spatial features of the Baltic climate, and they can be used in further analysis of climate change impact. Groundwater level fluctuations in confined aquifer wells with long observations exhibit site-specific fractal scaling behavior, and the underlying distribution exhibits either non-Gaussian characteristics, which may be fitted by the Lévy stable distribution, or Gaussian characteristics. The estimated Hurst exponent is highly dependent on the length and the specific time interval of the time series. The MF-DFA and MMA analyses showed that different levels of multifractality exist. We provide an explanation why land temperatures respond more strongly to global warming than ocean temperatures, a robust finding in observations and models that has so far not been understood well. We explain it by the different ways by which ocean and land surfaces buffer the strong variation in solar radiation and demonstrate this with a simple, physically based model. 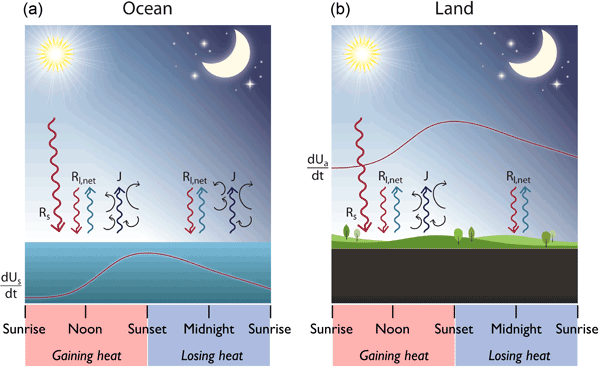 Our explanation also illustrates why nighttime temperatures warm more strongly, another robust finding of global warming. Anomalies and extremes are often detected using univariate peak-over-threshold approaches in the geoscience community. The Earth system is highly multivariate. We compare eight multivariate anomaly detection algorithms and combinations of data preprocessing. We identify three anomaly detection algorithms that outperform univariate extreme event detection approaches. The workflows have the potential to reveal novelties in data. Remarks on their application to real Earth observations are provided. Weather and climate models have improved steadily over time, but the models remain imperfect. Given these imperfect models, predictions might be improved by combining the models into a so-called “supermodel”. In this paper we show a new method to construct such a supermodel. The results indicate that the supermodel has superior forecast quality compared to the individual models. We introduce a general technique to detect a climate change signal in the coherent and turbulent components of the atmospheric circulation. Our analysis suggests that the coherent components (atmospheric waves, long-term oscillations) will experience the greatest changes in future climate, proportionally to the greenhouse gas emission scenario considered. We find early warnings of abrupt changes in complex dynamical systems such as the climate where the usual early warning indicators do not work. In particular, these are systems that are periodically forced, for example by the annual cycle of solar insolation. We show these indicators are good theoretically in a general setting then apply them to a specific system, that of the Arctic sea ice, which has been conjectured to be close to such a tipping point. We do not find evidence of it. We analyse scaling in temperature signals for the late quaternary climate, and focus on the effects of regime shifting events such as the Dansgaard-Oeschger cycles and the shifts between glacial and interglacial conditions. When these events are omitted from a scaling description the climate noise is consistent with a 1/f law on timescales from months to 105 years. If the events are included in the description, we obtain a model that is inherently non-stationary. We compare the statistical properties of solar, volcanic and combined forcings over the range from 1 to 1000 years to see over which scale ranges they additively combine, a prediction of linear response. The main findings are (a) that the variability in the Zebiac–Cane model and GCMs are too weak at centennial and longer scales; (b) for longer than ≈ 50 years, the forcings combine subadditively; and (c) at shorter scales, strong (intermittency, e.g. volcanic) forcings are nonlinear. We draw on the premise that climate conflict reflects a continuum of conditional forces that often coalesce around the notion of vulnerability to show how vulnerability is portrayed in the discursive formation of climate conflict relations. Comparing three discourse types, we illustrate that a turn towards contextual vulnerability thinking will help advance a constructivist theory-informed climate conflict scholarship that recognises historicity, specificity and variability. Human and natural forces drive climate change. If we have a model for the climate response to forcing, we can identify distinct fingerprints for each force, and their footprint in the observed global temperature can be determined by statistical analysis. This process is called attribution. This work examines the effect delays (long-range memory) in the climate response have on the magnitude of the various footprints. The magnitude of the human footprint turns out to be only weakly affected. This paper uses observations of global and national energy use to attempt to show that the growth in energy use over the last 160 years can be related to the distribution constraints imposed by the networks that link environmentally derived resources to points of end use. 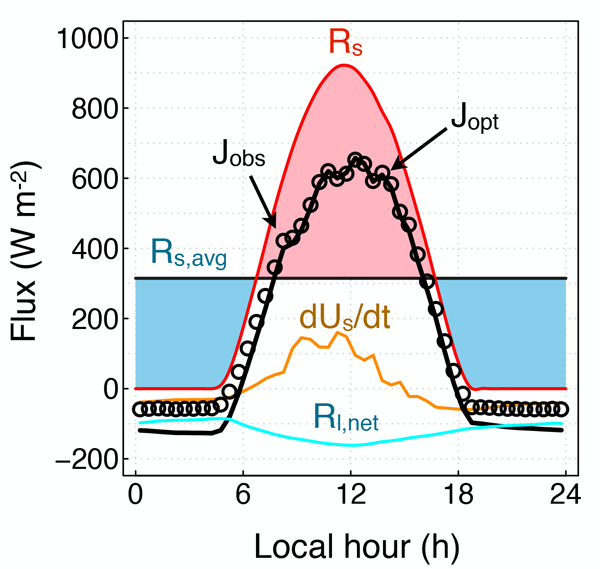 Having accounted for the distribution efficiency of this global-scale network, we speculate that the observed long-run return rate on energy of ~2.4%/yr requires regulated deployment of acquisition and end use efficiencies. 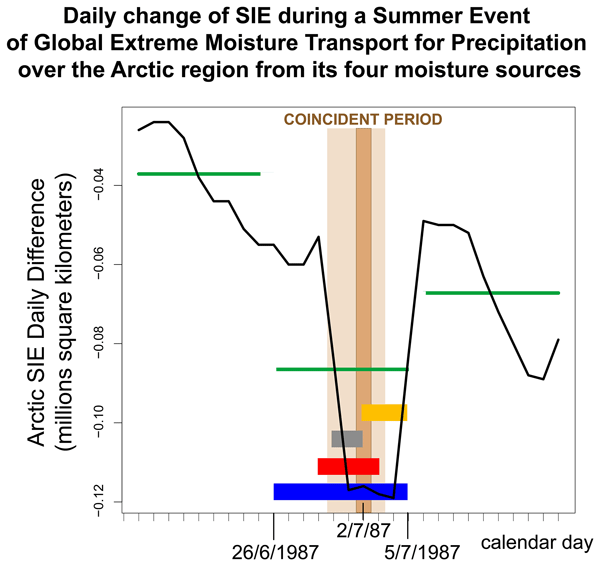 There appears to be a connection between two climate change indicators: an increase in evaporation over source regions and Arctic ice melting. Emissions due to human activity impact on rainfall. This impact depends on the properties of the gases or particles that are emitted. This paper uses improved understanding of relevant processes to produce a new measure, called the Global Precipitation-change Potential, which allows a direct comparison of the effect of different emissions on global-mean rainfall. Carbon dioxide, in the years following its emission, is shown to be less effective than methane emissions at causing rainfall change. A three-step climate classification – input variable selection, principal components analysis and k-means clustering – was applied to a spatial domain covering the Himalayan arc and adjacent plains regions using input data from four global meteorological reanalyses. 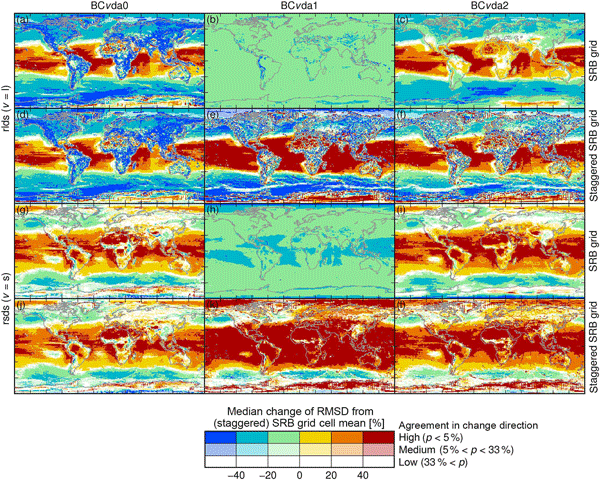 This revealed a reanalysis ensemble consensus for eight macro-climate zones. Zonal statistics revealed consistent, distinct climatologies. This approach has implications for resource assessments and data set bias characterisations. Ambitious hydropower plans in the Eastern Himalayas prominently involve the private finance sector. We question the framing of hydropower as green energy, interrogate its links with climate change, and examine its potential for investment and capital accumulation and show a number of serious contradictions. Impacts cannot be simply predicted, controlled or mitigated. More focus on political economic drivers and geo-ecological uncertainties infused with localized understandings is sorely needed. Abraham, J. P., Baringer, M., Bindoff, N. L., Boyer, T., Cheng, L. J., Church, J. A., Conroy, J. L., Domingues, C. M., Fasullo, J. T., Gilson, J., Goni, G., Good, S. A., Gorman, J. M., Gouretski, V., Ishii, M., Johnson, G. C., Kizu, S., Lyman, J. M., Macdonald, A. M., Minkowycz, W. J., Moffitt, S. E., Palmer, M. D., Piola, A. R., Reseghetti, F., Schuckmann, K., Trenberth, K. E., Velicogna, I., and Willis, J. K.: A review of global ocean temperature observations: Implications for ocean heat content estimates and climate change, Rev. Geophys., 51, 450–483, https://doi.org/10.1002/rog.20022, 2013. Aldrin, M., Holden, M., Guttorp, P., Skeie, R. B., Myhre, G., and Berntsen, T. K.: Bayesian estimation of climate sensitivity based on a simple climate model fitted to observations of hemispheric temperatures and global ocean heat content, Environmetrics, 23, 253–271, https://doi.org/10.1002/env.2140, 2012. Allen, M. R. and Frame, D. J.: Call Off the Quest, Science, 318, 582–583, https://doi.org/10.1126/science.1149988, 2007. Allen, M. R., Stott, P. A., Mitchell, J. F. B., Schnur, R., and Delworth, T. L.: Quantifying the uncertainty in forecasts of anthropogenic climate change, Nature, 407, 617–620, 2000. Ammann, C. M., Meehl, G. A., Washington, W. M., and Zender, C. S.: A monthly and latitudinally varying volcanic forcing dataset in simulations of 20th century climate, Geophys. Res. Lett., 30, 1657, https://doi.org/10.1029/2003gl016875, 2003. Andrews, T., Gregory, J. M., Webb, M. J., and Taylor, K. E.: Forcing, feedbacks and climate sensitivity in CMIP5 coupled atmosphere-ocean climate models, Geophys. Res. Lett., 39, L09712, https://doi.org/10.1029/2012GL051607, 2012. Andronova, N. G. and Schlesinger, M. E.: Objective estimation of the probability density function for climate sensitivity, J. Geophys. Res., 106, 22605–22611, 2001. Annan, J. D. and Hargreaves, J. C.: Using multiple observationally-based constraints to estimate climate sensitivity, Geophys. Res. Lett., 33, L06704, https://doi.org/10.1029/2005gl025259, 2006. Annan, J. D. and Hargreaves, J. C.: On the generation and interpretation of probabilistic estimates of climate sensitivity, Climatic Change, 104, 423–436, https://doi.org/10.1007/s10584-009-9715-y, 2011. 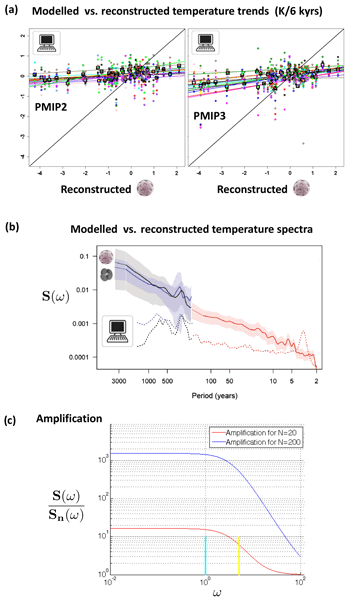 Annan, J. D., Hargreaves, J. C., Ohgaito, R., Abe-Ouchi, A., and Emori, S.: Efficiently Constraining Climate Sensitivity with Ensembles of Paleoclimate Simulations, SOLA, 1, 181–184, 2005. Armour, K. C., Bitz, C. M., and Roe, G. H.: Time-Varying Climate Sensitivity from Regional Feedbacks, J. Climate, 26, 4518–4534, https://doi.org/10.1175/JCLI-D-12-00544.1, 2012. Arneth, A., Harrison, S. P., Zaehle, S., Tsigaridis, K., Menon, S., Bartlein, P. J., Feichter, J., Korhola, A., Kulmala, M., O'Donnell, D., Schurgers, G., Sorvari, S., and Vesala, T.: Terrestrial biogeochemical feedbacks in the climate system, Nat. Geosci., 3, 525–532, https://doi.org/10.1038/ngeo905, 2010. Arora, V. K., Boer, G. J., Christian, J. R., Curry, C. L., Denman, K. L., Zahariev, K., Flato, G. M., Scinocca, J. F., Merryfield, W. J., and Lee, W. G.: The Effect of Terrestrial Photosynthesis Down Regulation on the Twentieth-Century Carbon Budget Simulated with the CCCma Earth System Model, J. Climate, 22, 6066–6088, https://doi.org/10.1175/2009JCLI3037.1, 2009. Bond, T. C., Bhardwaj, E., Dong, R., Jogani, R., Jung, S. K., Roden, C., Streets, D. G., and Trautmann, N. M.: Historical emissions of black and organic carbon aerosol from energy-related combustion, 1850–2000, Global Biogeochem. Cy., 21, Gb2018, https://doi.org/10.1029/2006gb002840, 2007. Booth, B. B. B., Dunstone, N. J., Halloran, P. R., Andrews, T., and Bellouin, N.: Aerosols implicated as a prime driver of twentieth-century North Atlantic climate variability, Nature, 484, 228–232, https://doi.org/10.1038/nature10946, 2012. Boucher, O. and Haywood, J.: On summing the components of radiative forcing of climate change, Clim. Dynam., 18, 297–302, https://doi.org/10.1007/s003820100185, 2001. Boucher, O., Randall, D., Artaxo, P., Bretherton, C., Feingold, G., Forster, P., Kerminen, V.-M., Kondo, Y., Liao, H., Lohmann, U., Rasch, P., Satheesh, S. K., Sherwood, S., Stevens, B., and Zhang, X. Y.: Clouds and Aerosols, in: Climate Change 2013: The Physical Science Basis, Contribution of Working Group I to the Fifth Assessment Report of the Intergovernmental Panel on Climate Change, edited by: Stocker, T. F., Qin, D., Plattner, G.-K., Tignor, M., Allen, S. K., Boschung, J., Nauels, A., Xia, Y., Bex, V., and Midgley, P. M., Cambridge University Press, Cambridge, UK and New York, NY, USA, 2013. Brohan, P., Kennedy, J. J., Harris, I., Tett, S. F. B., and Jones, P. D.: Uncertainty estimates in regional and global observed temperature changes: A new data set from 1850, J. Geophys. Res., 111, D12106, https://doi.org/10.1029/2005JD006548, 2006. Church, J. A., White, N. J., Konikow, L. F., Domingues, C. M., Cogley, J. G., Rignot, E., Gregory, J. M., van den Broeke, M. R., Monaghan, A. J., and Velicogna, I.: Revisiting the Earth's sea-level and energy budgets from 1961 to 2008, Geophys. Res. Lett., 38, L18601, https://doi.org/10.1029/2011gl048794, 2011. Collins, M., Knutti, R., Arblaster, J. M., Dufresne, J.-L., Fichefet, T., Friedlingstein, P., Gao, X., Gutowski, W. J., Johns, T., Krinner, G., Shongwe, M., Tebaldi, C., Weaver, A. J., and Wehner, M.: Long-term Climate Change: Projections, Commitments and Irreversibility, in: Climate Change 2013: The Physical Science Basis, Contribution of Working Group I to the Fifth Assessment Report of the Intergovernmental Panel on Climate Change, edited by: Stocker, T. F., Qin, D., Plattner, G.-K., Tignor, M., Allen, S. K., Boschung, J., Nauels, A., Xia, Y., Bex, V., and Midgley, P. M., Cambridge University Press, Cambridge, UK and New York, NY, USA, 2013. Crowley, T. J., Baum, S. K., Kim, K. Y., Hegerl, G. C., and Hyde, W. T.: Modeling ocean heat content changes during the last millennium, Geophys. Res. Lett., 30, 1932, https://doi.org/10.1029/2003gl017801, 2003. Cubasch, U., Meehl, G. A., Boer, G. J., Stouffer, R. J., Dix, M., Noda, A., Senior, C. A., Raper, S., Yap, K. S., Abe-Ouchi, A., Brinkop, S., Claussen, M., Collins, M., Evans, J., Fischer-Bruns, I., Flato, G., Fyfe, J. C., Ganopolski, A., Gregory, J. M., Hu, Z.-Z., Joos, F., Knutson, T., Knutti, R., Landsea, C., Mearns, L., Milly, C., Mitchell, J. F. B., Nozawa, T., Paeth, H., Räisänen, J., Sausen, R., Smith, S., Stocker, T., Timmermann, A., Ulbrich, U., Weaver, A., Wegner, J., Whetton, P., Wigley, T., Winton, M., and Zwiers, F.: Projections of Future Climate Change, in: Climate Change 2001: The Scientific Basis, Contribution of Working Group I to the Fourth Assessment Report of the Intergovernmental Panel on Climate Change, edited by: Houghton, J. T., Ding, Y., Griggs, D. J., Noguer, M., van der Linden, P. J., Dai, X., Maskell, K., and Johnson, C. A., Cambridge University Press, 2001. Delaygue, G. and Bard, E.: An Antarctic view of Beryllium-10 and solar activity for the past millennium, Clim. Dynam., 36, 2201–2218, https://doi.org/10.1007/s00382-010-0795-1, 2011. DelSole, T., Tippett, M. K., and Shukla, J.: A Significant Component of Unforced Multidecadal Variability in the Recent Acceleration of Global Warming, J. Climate, 24, 909–926, https://doi.org/10.1175/2010jcli3659.1, 2011. Denman, K. L., Brasseur, G., Chidthaisong, A., Ciais, P., Cox, P. M., Dickinson, R. E., Hauglustaine, D. H. C., Holland, E., Jacob, D., Lohmann, U. R. S., da Silva Dias, P. L., Wofsy, S. C., and Zhang, X.: Couplings Between Changes in the Climate System and Biogeochemistry, in: Climate Change 2007: The Physical Science Basis, Contribution of Working Group I to the Fourth Assessment Report of the Intergovernmental Panel on Climate Change, edited by: Solomon, S., Qin, D., Manning, M., Chen, Z., Marquis, M., Averyt, K. B., Tignor, M., and Miller, H. L., Cambridge University Press, Cambridge, UK and New York, NY, USA, 2007. Dessler, A. E., Schoeberl, M. R., Wang, T., Davis, S. M., and Rosenlof, K. H.: Stratospheric water vapor feedback, P. Natl. Acad. Sci., 110, 18087–18091, https://doi.org/10.1073/pnas.1310344110, 2013. Domingues, C. M., Church, J. A., White, N. J., Gleckler, P. J., Wijffels, S. E., Barker, P. M., and Dunn, J. R.: Improved estimates of upper-ocean warming and multi-decadal sea-level rise, Nature, 453, 1090–1093, https://doi.org/10.1038/nature07080, 2008. Easterling, D. R. and Wehner, M. F.: Is the climate warming or cooling?, Geophys. Res. Lett., 36, L08706, https://doi.org/10.1029/2009gl037810, 2009. Fiore, A. M., Dentener, F. J., Wild, O., Cuvelier, C., Schultz, M. G., Hess, P., Textor, C., Schulz, M., Doherty, R. M., Horowitz, L. W., MacKenzie, I. A., Sanderson, M. G., Shindell, D. T., Stevenson, D. S., Szopa, S., Van Dingenen, R., Zeng, G., Atherton, C., Bergmann, D., Bey, I., Carmichael, G., Collins, W. J., Duncan, B. N., Faluvegi, G., Folberth, G., Gauss, M., Gong, S., Hauglustaine, D., Holloway, T., Isaksen, I. S. A., Jacob, D. J., Jonson, J. E., Kaminski, J. W., Keating, T. J., Lupu, A., Marmer, E., Montanaro, V., Park, R. J., Pitari, G., Pringle, K. J., Pyle, J. A., Schroeder, S., Vivanco, M. G., Wind, P., Wojcik, G., Wu, S., and Zuber, A.: Multimodel estimates of intercontinental source-receptor relationships for ozone pollution, J. Geophys. Res., 114, D04301, https://doi.org/10.1029/2008jd010816, 2009. Forest, C. E., Stone, P. H., Sokolov, A. P., Allen, M. R., and Webster, M. D.: Quantifying uncertainties in climate system properties with the use of recent climate observations, Science, 295, 113–117, 2002. Forest, C. E., Stone, P. H., and Sokolov, A. P.: Estimated PDFs of climate system properties including natural and anthropogenic forcings, Geophys. Res. Lett., 33, L01705, https://doi.org/10.1029/2005GL023977, 2006. Forest, C. E., Stone, P. H., and Sokolov, A. P.: Constraining climate model parameters from observed 20th century changes, Tellus A, 60, 911–920, https://doi.org/10.1111/j.1600-0870.2008.00346.x, 2008. Forster, P., Ramaswamy, V., Artaxo, P., Berntsen, T., Betts, R., Fahey, D. W., Haywood, J., Lean, J., Lowe, D. C., Myhre, G., Nganga, J., Prinn, R., Raga, G., Schulz, M., and Dorland, R. V.: Changes in Atmospheric Constituents and in Radiative Forcing, in: Climate Change 2007: The Physical Science Basis, Contribution of Working Group I to the Fourth Assessment Report of the Intergovernmental Panel on Climate Change, edited by: Solomon, S., Qin, D., Manning, M., Chen, Z., Marquis, M., Averyt, K. B., Tignor, M., and Miller, H. L., Cambridge Univ. Press, Cambridge and New York, 2007. Frame, D. J., Booth, B. B. B., Kettleborough, J. A., Stainforth, D. A., Gregory, J. M., Collins, M., and Allen, M. R.: Constraining climate forecasts: The role of prior assumptions, Geophys. Res. Lett., 32, L09702, https://doi.org/10.1029/2004GL022241, 2005. Friedman, A. R., Hwang, Y.-T., Chiang, J. C. H., and Frierson, D. M. W.: Interhemispheric Temperature Asymmetry over the Twentieth Century and in Future Projections, J. Climate, 26, 5419–5433, https://doi.org/10.1175/JCLI-D-12-00525.1, 2013. Frohlich, C. and Lean, J.: Solar radiative output and its variability: evidence and mechanisms, Astron. Astrophys. Rev., 12, 273–320, 2004. Fuglestvedt, J. S. and Berntsen, T.: A simple model for scenario studies of changes in global climate: Version 1.0, Working Paper 1999:02 CICERO, available at: http://www.cicero.uio.no/media/187.pdf, last access: 6 August 2013, CICERO, Oslo, Norway, 1999. Fuglestvedt, J. S., Berntsen, T. K., Godal, O., Sausen, R., Shine, K. P., and Skodvin, T.: Metrics of climate change: Assessing radiative forcing and emission indices, Climatic Change, 58, 267–331, 2003. Gao, C. C., Robock, A., and Ammann, C.: Volcanic forcing of climate over the past 1500 years: An improved ice core-based index for climate models, J. Geophys. Res., 113, D23111, https://doi.org/10.1029/2008jd010239, 2008. Gillett, N. P., Arora, V. K., Flato, G. M., Scinocca, J. F., and von Salzen, K.: Improved constraints on 21st-century warming derived using 160 years of temperature observations, Geophys. Res. Lett., 39, L01704, https://doi.org/10.1029/2011gl050226, 2012. Gouretski, V. and Koltermann, K. P.: How much is the ocean really warming?, Geophys. Res. Lett., 34, L01610, https://doi.org/10.1029/2006gl027834, 2007. Gray, L. J., Rumbold, S. T., and Shine, K. P.: Stratospheric Temperature and Radiative Forcing Response to 11-Year Solar Cycle Changes in Irradiance and Ozone, J. Atmos. Sci., 66, 2402–2417, https://doi.org/10.1175/2009jas2866.1, 2009. Gregory, J. M. and Forster, P. M.: Transient climate response estimated from radiative forcing and observed temperature change, J. Geophys. Res., 113, D23105, https://doi.org/10.1029/2008jd010405, 2008. Gregory, J. M., Stouffer, R. J., Raper, S. C. B., Stott, P. A., and Rayner, N. A.: An observationally based estimate of the climate sensitivity, J. Climate, 15, 3117–3121, 2002. Hall, J. C. and Lockwood, G. W.: The chromospheric activity and variability of cycling and flat activity solar-analog stars, Astrophys. J., 614, 942–946, 2004. Hannart, A., Dufresne, J. L., and Naveau, P.: Why climate sensitivity may not be so unpredictable, Geophys. Res. Lett., 36, L16707, https://doi.org/10.1029/2009gl039640, 2009. Hansen, J., Russell, G., Lacis, A., Fung, I., Rind, D., and Stone, P.: Climate response-times – dependence on climate sensitivity and ocean mixing, Science, 229, 857–859, 1985. Hansen, J., Sato, M., Ruedy, R., Nazarenko, L., Lacis, A., Schmidt, G. A., Russell, G., Aleinov, I., Bauer, M., Bauer, S., Bell, N., Cairns, B., Canuto, V., Chandler, M., Cheng, Y., Del Genio, A., Faluvegi, G., Fleming, E., Friend, A., Hall, T., Jackman, C., Kelley, M., Kiang, N., Koch, D., Lean, J., Lerner, J., Lo, K., Menon, S., Miller, R., Minnis, P., Novakov, T., Oinas, V., Perlwitz, J., Rind, D., Romanou, A., Shindell, D., Stone, P., Sun, S., Tausnev, N., Thresher, D., Wielicki, B., Wong, T., Yao, M., and Zhang, S.: Efficacy of climate forcings, J. Geophys. Res., 110, D18104, https://doi.org/10.1029/2005JD005776, 2005. Hansen, J., Sato, M., Ruedy, R., Lo, K., Lea, D. W., and Medina-Elizade, M.: Global temperature change, Proc. Natl. Acad. Sci. USA, 103, 14288–14293, https://doi.org/10.1073/pnas.0606291103, 2006. Hansen, J., Ruedy, R., Sato, M., and Lo, K.: Global surface temperature change, Rev. Geophys., 48, Rg4004, https://doi.org/10.1029/2010rg000345, 2010. Hansen, J., Sato, M., Russell, G., and Kharecha, P.: Climate sensitivity, sea level and atmospheric carbon dioxide, Philos. T. Roy. Soc. A, 371, 20120294, https://doi.org/10.1098/rsta.2012.0294, 2013. Hansen, J. E. and Sato, M.: Paleoclimate implications for human-made climate change, in: Climate Change: Inferences from Paleoclimate and Regional Aspects, edited by: A. Berger, F. Mesinger, and Šijači, D., Springer, Vienna, 21–48, 2012. Hargreaves, J. C., Annan, J. D., Yoshimori, M., and Abe-Ouchi, A.: Can the Last Glacial Maximum constrain climate sensitivity?, Geophys. Res. Lett., 39, L24702, https://doi.org/10.1029/2012GL053872, 2012. 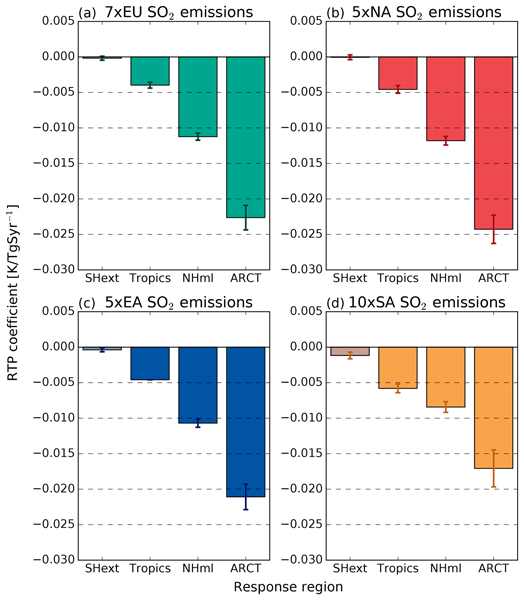 Hegerl, G. C., Crowley, T. J., Hyde, W. T., and Frame, D. J.: Climate sensitivity constrained by temperature reconstructions over the past seven centuries, Nature, 440, 1029–1032, https://doi.org/10.1038/nature04679, 2006. Hegerl, G. C., Zwiers, F. W., Braconnot, P., Gillett, N. P., Luo, Y., Marengo Orsini, J. A., Nicholls, N., Penner, J. E., and Stott, P. A.: Understanding and Attributing Climate Change., in: Climate Change 2007: The Physical Science Basis, Contribution of Working Group I to the Fourth Assessment Report of the Intergovernmental Panel on Climate Change, edited by: Solomon, S., Qin, D., Manning, M., Chen, Z., Marquis, M., Averyt, K. B., Tignor, M., and Miller, H. L., Cambridge Univ. Press, Cambridge and New York, 2007. Huber, M. and Knutti, R.: Anthropogenic and natural warming inferred from changes in Earth's energy balance, Nat. Geosci., 5, 31–36, https://doi.org/10.1038/ngeo1327, 2012. Huber, M. B.: The Earth's Energy Balance and its Changes: Implications for Past and Future Temperature Change, ETH, Zurich, Switzerland, 2011. IPCC: Summary for Policymakers, in: Climate Change 2013: The Physical Science Basis, Contribution of Working Group I to the Fifth Assessment Report of the Intergovernmental Panel on Climate Change, edited by: Stocker, T. F., Qin, D., Plattner, G.-K., Tignor, M., Allen, S. K., Boschung, J., Nauels, A., Xia, Y., Bex, V., and Midgley, P. M., Cambridge University Press, Cambridge, UK and New York, NY, USA, 2013. Isaksen, I. S. A., Granier, C., Myhre, G., Berntsen, T. K., Dalsoren, S. B., Gauss, M., Klimont, Z., Benestad, R., Bousquet, P., Collins, W., Cox, T., Eyring, V., Fowler, D., Fuzzi, S., Jockel, P., Laj, P., Lohmann, U., Maione, M., Monks, P., Prevot, A. S. H., Raes, F., Richter, A., Rognerud, B., Schulz, M., Shindell, D., Stevenson, D. S., Storelvmo, T., Wang, W. C., van Weele, M., Wild, M., and Wuebbles, D.: Atmospheric composition change: Climate-Chemistry interactions, Atmos. Environ., 43, 5138–5192, https://doi.org/10.1016/j.atmosenv.2009.08.003, 2009. Ishii, M. and Kimoto, M.: Reevaluation of historical ocean heat content variations with time-varying XBT and MBT depth bias corrections, J. Oceanogr., 65, 287–299, https://doi.org/10.1007/s10872-009-0027-7, 2009. Joshi, M., Shine, K., Ponater, M., Stuber, N., Sausen, R., and Li, L.: A comparison of climate response to different radiative forcings in three general circulation models: towards an improved metric of climate change, Clim. Dynam., 20, 843–854, https://doi.org/10.1007/s00382-003-0305-9, 2003. Kaufmann, R. K., Kauppi, H., Mann, M. L., and Stock, J. H.: Reconciling anthropogenic climate change with observed temperature 1998–2008, P. Natl. Acad. Sci., 108, 11790–11793, https://doi.org/10.1073/pnas.1102467108, 2011. Kennedy, M. C. and O'Hagan, A.: Bayesian calibration of computer models, J. Roy. Stat. Soc. B, 63, 425–450, 2001. Kerr, R. A.: A North Atlantic climate pacemaker for the centuries, Science, 288, 1984–1986, 2000. Knight, J. R.: The Atlantic Multidecadal Oscillation Inferred from the Forced Climate Response in Coupled General Circulation Models, J. Climate, 22, 1610–1625, https://doi.org/10.1175/2008jcli2628.1, 2009. Knutti, R. and Hegerl, G. C.: The equilibrium sensitivity of the Earth's temperature to radiation changes, Nat. Geosci., 1, 735–743, https://doi.org/10.1038/ngeo337, 2008. Knutti, R. and Tomassini, L.: Constraints on the transient climate response from observed global temperature and ocean heat uptake, Geophys. Res. Lett., 35, L09701, https://doi.org/10.1029/2007gl032904, 2008. 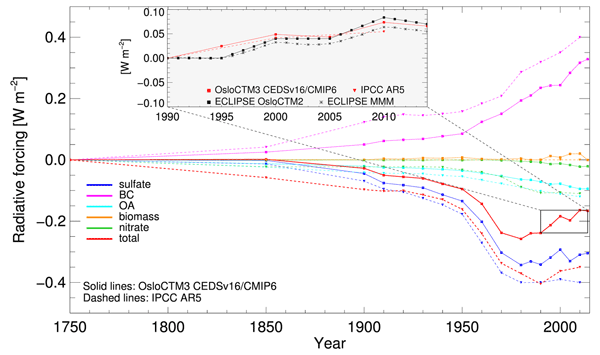 Knutti, R., Stocker, T. F., Joos, F., and Plattner, G.-K.: Constraints on radiative forcing and future climate change from observations and climate model ensembles, Nature, 416, 719–723, 2002. Kohler, P., Bintanja, R., Fischer, H., Joos, F., Knutti, R., Lohmann, G., and Masson-Delmotte, V.: What caused Earth's temperature variations during the last 800,000 years? Data-based evidence on radiative forcing and constraints on climate sensitivity, Quaternary Sci. Rev., 29, 129–145, https://doi.org/10.1016/j.quascirev.2009.09.026, 2010. Kouketsu, S., Doi, T., Kawano, T., Masuda, S., Sugiura, N., Sasaki, Y., Toyoda, T., Igarashi, H., Kawai, Y., Katsumata, K., Uchida, H., Fukasawa, M., and Awaji, T.: Deep ocean heat content changes estimated from observation and reanalysis product and their influence on sea level change, J. Geophys. Res.-Oceans, 116, C03012, https://doi.org/10.1029/2010JC006464, 2011. Krivova, N. A., Balmaceda, L., and Solanki, S. K.: Reconstruction of solar total irradiance since 1700 from the surface magnetic flux, Astron. Astrophys., 467, 335–346, https://doi.org/10.1051/0004-6361:20066725, 2007. Lean, J.: Evolution of the sun's spectral irradiance since the Maunder Minimum, Geophys. Res. Lett., 27, 2425–2428, 2000. Levitus, S., Antonov, J. I., Boyer, T. P., Locarnini, R. A., Garcia, H. E., and Mishonov, A. V.: Global ocean heat content 1955–2008 in light of recently revealed instrumentation problems, Geophys. Res. Lett., 36, L07608, https://doi.org/10.1029/2008gl037155, 2009. Levitus, S., Antonov, J. I., Boyer, T. P., Baranova, O. K., Garcia, H. E., Locarnini, R. A., Mishonov, A. V., Reagan, J. R., Seidov, D., Yarosh, E. S., and Zweng, M. M.: World ocean heat content and thermosteric sea level change (0–2000 m), 1955–2010, Geophys. Res. Lett., 39, L10603, https://doi.org/10.1029/2012GL051106, 2012. Lewis, N.: An Objective Bayesian Improved Approach for Applying Optimal Fingerprint Techniques to Estimate Climate Sensitivity, J. Climate, 26, 7414–7429, https://doi.org/10.1175/JCLI-D-12-00473.1, 2013. Libardoni, A. G. and Forest, C. E.: Sensitivity of distributions of climate system properties to the surface temperature dataset, Geophys. Res. Lett., 38, L22705, https://doi.org/10.1029/2011gl049431, 2011. Lyman, J. M., Good, S. A., Gouretski, V. V., Ishii, M., Johnson, G. C., Palmer, M. D., Smith, D. M., and Willis, J. K.: Robust warming of the global upper ocean, Nature, 465, 334–337, https://doi.org/10.1038/nature09043, 2010. Meehl, G. A., Stocker, T. F., Collins, W. D., Friedlingstein, P., Gaye, A. T., Gregory, J. M., Kitoh, A., Knutti, R., Murphy, J. M., Noda, A., Raper, S. C. B., Watterson, I. G., Weaver, A. J., and Zhao, Z.-C.: Global Climate Projections, in: Climate Change 2007: The Physical Science Basis, Contribution of Working Group I to the Fourth Assessment Report of the Intergovernmental Panel on Climate Change, edited by: Solomon, S., Qin, D., Manning, M., Chen, Z., Marquis, M., Averyt, K. B., Tignor, M., and Miller, H. L., Cambridge University Press, Cambridge, UK and New York, NY, USA, 2007. Meehl, G. A., Arblaster, J. M., Fasullo, J. T., Hu, A., and Trenberth, K. E.: Model-based evidence of deep-ocean heat uptake during surface-temperature hiatus periods, Nat. Clim. Change, 1, 360–364, https://doi.org/10.1038/nclimate1229, 2011. Meinshausen, M., Meinshausen, N., Hare, W., Raper, S. C. B., Frieler, K., Knutti, R., Frame, D. J., and Allen, M. R.: Greenhouse-gas emission targets for limiting global warming to 2 degrees C, Nature, 458, 1158–1196, https://doi.org/10.1038/nature08017, 2009. Meinshausen, M., Raper, S. C. B., and Wigley, T. M. L.: Emulating coupled atmosphere-ocean and carbon cycle models with a simpler model, MAGICC6 – Part 1: Model description and calibration, Atmos. Chem. Phys., 11, 1417–1456, https://doi.org/10.5194/acp-11-1417-2011, 2011. Morice, C. P., Kennedy, J. J., Rayner, N. A., and Jones, P. D.: Quantifying uncertainties in global and regional temperature change using an ensemble of observational estimates: The HadCRUT4 data set, J. Geophys. Res.-Atmos., 117, D08101, https://doi.org/10.1029/2011JD017187, 2012. Murphy, D. M., Solomon, S., Portmann, R. W., Rosenlof, K. H., Forster, P. M., and Wong, T.: An observationally based energy balance for the Earth since 1950, J. Geophys. Res., 114, D17107, https://doi.org/10.1029/2009jd012105, 2009. Murphy, J. M.: Transient Response of the Hadley Centre Coupled Ocean-Atmosphere Model to Increasing Carbon Dioxide, Part 1: Control Climate and Flux Adjustment, J. Climate, 8, 36–56, https://doi.org/10.1175/1520-0442(1995)008<0036:TROTHC>2.0.CO;2, 1995. Murphy, J. M., Sexton, D. M. H., Barnett, D. N., Jones, G. S., Webb, M. J., and Collins, M.: Quantification of modelling uncertainties in a large ensemble of climate change simulations, Nature, 430, 768–772, https://doi.org/10.1038/nature02771, 2004. Myhre, G.: Consistency Between Satellite-Derived and Modeled Estimates of the Direct Aerosol Effect, Science, 325, 187–190, https://doi.org/10.1126/science.1174461, 2009. Myhre, G., Shindell, D., Bréon, F.-M., Collins, W., Fuglestvedt, J., Huang, J., Koch, D., Lamarque, J.-F., Lee, D., Mendoza, B., Nakajima, T., Robock, A., Stephens, G., Takemura, T., and Zhang, H.: Anthropogenic and Natural Radiative Forcing, in: Climate Change 2013: The Physical Science Basis, Contribution of Working Group I to the Fifth Assessment Report of the Intergovernmental Panel on Climate Change, edited by: Stocker, T. F., Qin, D., Plattner, G.-K., Tignor, M., Allen, S. K., Boschung, J., Nauels, A., Xia, Y., Bex, V., and Midgley, P. M., Cambridge University Press, Cambridge, UK and New York, NY, USA, 2013. Olivie, D. and Stuber, N.: Emulating AOGCM results using simple climate models, Clim. Dynam., 35, 1257–1287, https://doi.org/10.1007/s00382-009-0725-2, 2010. Olson, R., Sriver, R., Goes, M., Urban, N. M., Matthews, H. D., Haran, M., and Keller, K.: A climate sensitivity estimate using Bayesian fusion of instrumental observations and an Earth System model, J. Geophys. Res.-Atmos., 117, D04103, https://doi.org/10.1029/2011JD016620, 2012. Ottera, O. H., Bentsen, M., Drange, H., and Suo, L.: External forcing as a metronome for Atlantic multidecadal variability, Nat. Geosci., 3, 688–694, https://doi.org/10.1038/ngeo955, 2010. Otto, A., Otto, F. E. L., Boucher, O., Church, J., Hegerl, G., Forster, P. M., Gillett, N. P., Gregory, J., Johnson, G. C., Knutti, R., Lewis, N., Lohmann, U., Marotzke, J., Myhre, G., Shindell, D., Stevens, B., and Allen, M. R.: Energy budget constraints on climate response, Nat. Geosci., 6, 415–416, https://doi.org/10.1038/ngeo1836, 2013. Padilla, L. E., Vallis, G. K., and Rowley, C. W.: Probabilistic Estimates of Transient Climate Sensitivity Subject to Uncertainty in Forcing and Natural Variability, J. Climate, 24, 5521–5537, https://doi.org/10.1175/2011jcli3989.1, 2011. Palmer, M., Antonov, J., Barker, P., Bindoff, N., Boyer, T., Carson, M., Domingues, C., Gleckler, P., Good, S., Gouretski, V., Guinehut, S., Haines, K., Harrison, D. E., Ishii, M., Johnson, G., Levitus, S., Lozier, S., Lyman, J., Meijers, A., von Schuckmann, K., Smith, D., Wijffels, S., and Willis, J.: Future observations for monitoring global ocean heat content, in: Proceedings of the "OceanObs' 09: Sustained Ocean Observations and Information for Society" Conference, Vol. 2, 21–25 September 2009, edited by: Hall, J., Harrison, D. E., and Stammer, D., ESA Publication WPP-306, Venice, Italy, 2010. Palmer, M. D., McNeall, D. J., and Dunstone, N. J.: Importance of the deep ocean for estimating decadal changes in Earth's radiation balance, Geophys. Res. Lett., 38, L13707, https://doi.org/10.1029/2011gl047835, 2011. Penner, J. E., Chen, Y., Wang, M., and Liu, X.: Possible influence of anthropogenic aerosols on cirrus clouds and anthropogenic forcing, Atmos. Chem. Phys., 9, 879–896, https://doi.org/10.5194/acp-9-879-2009, 2009. Piani, C., Frame, D. J., Stainforth, D. A., and Allen, M. R.: Constraints on climate change from a multi-thousand member ensemble of simulations, Geophys. Res. Lett., 32, L23825, https://doi.org/10.1029/2005gl024452, 2005. Purkey, S. G. and Johnson, G. C.: Warming of Global Abyssal and Deep Southern Ocean Waters between the 1990s and 2000s: Contributions to Global Heat and Sea Level Rise Budgets, J. Climate, 23, 6336–6351, https://doi.org/10.1175/2010jcli3682.1, 2010. 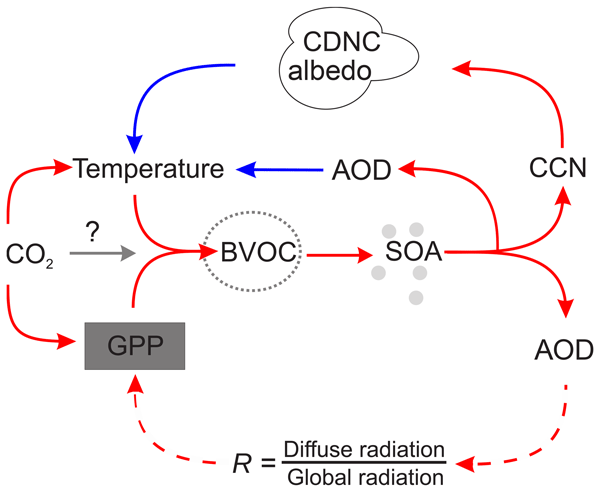 Raper, S. C. B., Gregory, J. M., and Osborn, T. J.: Use of an upwelling-diffusion energy balance climate model to simulate and diagnose A/OGCM results, Clim. Dynam., 17, 601–613, 2001. Ring, M. J., Lindner, D., Cross, E. F., and Schlesinger, M. E.: Causes of the Global Warming Observed since the 19th Century, Atmos. Clim. Sci., 2, 401–415, https://doi.org/10.4236/acs.2012.24035, 2012. Rive, N., Torvanger, A., Berntsen, T., and Kallbekken, S.: To what extent can a long-term temperature target guide near-term climate change commitments?, Climatic Change, 82, 373–391, 2007. Roe, G. H. and Armour, K. C.: How sensitive is climate sensitivity?, Geophys. Res. Lett., 38, L14708, https://doi.org/10.1029/2011gl047913, 2011. Roe, G. H. and Baker, M. B.: Why is climate sensitivity so unpredictable?, Science, 318, 629–632, 2007. Royer, D. L., Berner, R. A., and Park, J.: Climate sensitivity constrained by CO2 concentrations over the past 420 million years, Nature, 446, 530–532, https://doi.org/10.1038/nature05699, 2007. Sato, M., Hansen, J. E., McCormick, M. P., and Pollack, J. B.: Stratospheric aerosol optical depths, 1850–1990, J. Geophys. Res., 98, 22987–22994, 1993. Schlesinger, M. E. and Jiang, X. J.: Simple-model representation of atmosphere-ocean GCMs and estimation of the time scale of CO2-induced climate change, J. Climate, 3, 1297–1315, 1990. Schlesinger, M. E., Jiang, X., and Charlson, R. J.: Implication of Anthropogenic Atmospheric Sulphate for the Sensitivity of the Climate System, in: Climate Change and Energy Policy: Proceedings of the International Conference on Global Climate Change: Its Mitigation Through Improved Production and Use of Energy, edited by: Rosen, L. and Glasser, R., American Institute of Physics, New York, 75–108, 1992. Schmittner, A., Urban, N. M., Shakun, J. D., Mahowald, N. M., Clark, P. U., Bartlein, P. J., Mix, A. C., and Rosell-Melé, A.: Climate Sensitivity Estimated from Temperature Reconstructions of the Last Glacial Maximum, Science, 334, 1385–1388, https://doi.org/10.1126/science.1203513, 2011. Schneider von Deimling, T., Held, H., Ganopolski, A., and Rahmstorf, S.: Climate sensitivity estimated from ensemble simulations of glacial climate, Clim. Dynam., 27, 149–163, https://doi.org/10.1007/s00382-006-0126-8, 2006. Skeie, R. B., Fuglestvedt, J., Berntsen, T., Lund, M. T., Myhre, G., and Rypdal, K.: Global temperature change from the transport sectors: Historical development and future scenarios, Atmos. Environ., 43, 6260–6270, https://doi.org/10.1016/j.atmosenv.2009.05.025, 2009. Skeie, R. B., Berntsen, T., Myhre, G., Pedersen, C. A., Ström, J., Gerland, S., and Ogren, J. A.: Black carbon in the atmosphere and snow, from pre-industrial times until present, Atmos. Chem. Phys., 11, 6809–6836, https://doi.org/10.5194/acp-11-6809-2011, 2011a. Skeie, R. B., Berntsen, T. K., Myhre, G., Tanaka, K., Kvalevåg, M. M., and Hoyle, C. R.: Anthropogenic radiative forcing time series from pre-industrial times until 2010, Atmos. Chem. Phys., 11, 11827–11857, https://doi.org/10.5194/acp-11-11827-2011, 2011b. Smith, T. M. and Reynolds, R. W.: A global merged land-air-sea surface temperature reconstruction based on historical observations (1880–1997), J. Climate, 18, 2021–2036, 2005. 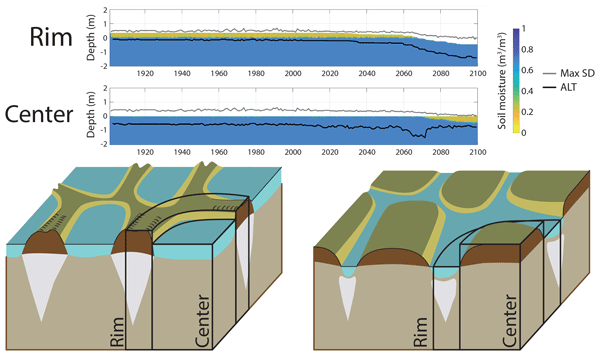 Smith, T. M., Reynolds, R. W., Peterson, T. C., and Lawrimore, J.: Improvements to NOAA's historical merged land-ocean surface temperature analysis (1880–2006), J. Climate, 21, 2283–2296, https://doi.org/10.1175/2007jcli2100.1, 2008. Sokolov, A. P.: Does model sensitivity to changes in CO2 provide a measure of sensitivity to other forcings?, J. Climate, 19, 3294–3306, 2006. Solomon, S., Rosenlof, K. H., Portmann, R. W., Daniel, J. S., Davis, S. M., Sanford, T. J., and Plattner, G.-K.: Contributions of Stratospheric Water Vapor to Decadal Changes in the Rate of Global Warming, Science, 327, 1219–1223, https://doi.org/10.1126/science.1182488, 2010. Stainforth, D. A., Aina, T., Christensen, C., Collins, M., Faull, N., Frame, D. J., Kettleborough, J. A., Knight, S., Martin, A., Murphy, J. M., Piani, C., Sexton, D., Smith, L. A., Spicer, R. A., Thorpe, A. J., and Allen, M. R.: Uncertainty in predictions of the climate response to rising levels of greenhouse gases, Nature, 433, 403–406, 2005. Steinhilber, F., Beer, J., and Frohlich, C.: Total solar irradiance during the Holocene, Geophys. Res. Lett., 36, L19704, https://doi.org/10.1029/2009gl040142, 2009. Stott, P. A., Mitchell, J. F. B., Allen, M. R., Delworth, T. L., Gregory, J. M., Meehl, G. A., and Santer, B. D.: Observational Constraints on Past Attributable Warming and Predictions of Future Global Warming, J. Climate, 19, 3055–3069, https://doi.org/10.1175/jcli3802.1, 2006. Tanaka, K., Raddatz, T., O'Neill, B. C., and Reick, C. H.: Insufficient forcing uncertainty underestimates the risk of high climate sensitivity, Geophys. Res. Lett., 36, L16709, https://doi.org/10.1029/2009gl039642, 2009. Tapping, K. F., Boteler, D., Charbonneau, P., Crouch, A., Manson, A., and Paquette, H.: Solar magnetic activity and total irradiance since the maunder minimum, Sol. Phys., 246, 309–326, https://doi.org/10.1007/s11207-007-9047-x, 2007. Thompson, D. W. J., Kennedy, J. J., Wallace, J. M., and Jones, P. D.: A large discontinuity in the mid-twentieth century in observed global-mean surface temperature, Nature, 453, 646–649, 2008. Thompson, D. W. J., Wallace, J. M., Kennedy, J. J., and Jones, P. D.: An abrupt drop in Northern Hemisphere sea surface temperature around 1970, Nature, 467, 444–447, https://doi.org/10.1038/nature09394, 2010. Tomassini, L., Reichert, P., Knutti, R., Stocker, T. F., and Borsuk, M. E.: Robust Bayesian uncertainty analysis of climate system properties using Markov chain Monte Carlo methods, J. Climate, 20, 1239–1254, https://doi.org/10.1175/jcli4064.1, 2007. Trenberth, K., Jones, P., Ambenje, P., Bojariu, R., Easterling, D., Tank, A., Parker, D., Rahimzadeh, F., Renwick, J., Rusticucci, M., Soden, B., and Zhai, P.: Observations: Surface and Atmospheric Climate Change, in: Climate Change 2007: The Physical Science Basis, Contribution of Working Group I to the Fourth Assessment Report of the Intergovernmental Panel on Climate, edited by: Solomon, S., Qin, D., Manning, M., Chen, Z., Marquis, M., Averyt, K. B., Tignor, M., and Miller, H. L., Cambridge Univ. Press, New York, 2007. UNFCCC: Report of the Conference of the Parties on its fifteenth session, held in Copenhagen from 7 to 19 December 2009 (FCCC/CP/2009/11/Add.1, United Nations, 2010); availible at http://unfccc.int/resource/docs/2009/cop15/eng/11a01.pdf (last access: January 2013), 2009. UNFCCC: Report of the Conference of the Parties on its sixteenth session, held in Cancun from 29 November to 10 December 2010 (FCCC/CP/2010/7/Add.1, United Nations, 2011); availible at http://unfccc.int/resource/docs/2010/cop16/eng/07a01.pdf (last access: January 2013), 2010. Urban, N. M. and Keller, K.: Complementary observational constraints on climate sensitivity, Geophys. Res. Lett., 36, L04708, https://doi.org/10.1029/2008gl036457, 2009. Vernier, J. P., Thomason, L. W., Pommereau, J. P., Bourassa, A., Pelon, J., Garnier, A., Hauchecorne, A., Blanot, L., Trepte, C., Degenstein, D., and Vargas, F.: Major influence of tropical volcanic eruptions on the stratospheric aerosol layer during the last decade, Geophys. Res. Lett., 38, L12807, https://doi.org/10.1029/2011gl047563, 2011.
von Schuckmann, K. and Le Traon, P. Y.: How well can we derive Global Ocean Indicators from Argo data?, Ocean Sci., 7, 783–791, https://doi.org/10.5194/os-7-783-2011, 2011. Wang, Y. M., Lean, J. L., and Sheeley, N. R.: Modeling the sun's magnetic field and irradiance since 1713, Astrophys. J., 625, 522–538, 2005. Wigley, T. M. L. and Schlesinger, M. E.: Analytical solution for the effect of increasing CO2 on global mean temperature, Nature, 315, 649–652, 1985. Wigley, T. M. L., Ammann, C. M., Santer, B. D., and Raper, S. C. B.: Effect of climate sensitivity on the response to volcanic forcing, J. Geophys. Res., 110, D09107, https://doi.org/10.1029/2004jd005557, 2005. Wild, M., Trüssel, B., Ohmura, A., Long, C. N., König-Langlo, G., Dutton, E. G., and Tsvetkov, A.: Global dimming and brightening: An update beyond 2000, J. Geophys. Res., 114, D00D13, https://doi.org/10.1029/2008jd011382, 2009. Wu, Z., Huang, N., Wallace, J., Smoliak, B., and Chen, X.: On the time-varying trend in global-mean surface temperature, Clim. Dynam., 37, 759–773, https://doi.org/10.1007/s00382-011-1128-8, 2011. Yang, D. and Saenko, O. A.: Ocean Heat Transport and Its Projected Change in CanESM2, J. Climate, 25, 8148–8163, https://doi.org/10.1175/JCLI-D-11-00715.1, 2012.